Limit Switches: This will ensure that that dolly stops when it gets to the end of the track. I mounted the battery by using the bungie cord off a couple of ball bungies to hold the battery down. I'm probably going to add a bracket to the back to ensure it doesn't slide off if I'm doing a steep incline. I also replaced the T-Nuts on the sides of the dolly from the ones that just had the teeth, to the ones that had screw holes. This should ensure that no matter how many cameras are mounted to the top, the wheels will not buckle. I used an aluminum hobby box which was purchased at Radio Scrap, and tried my best to solder and heat shrink all of the connections. I've also added a bunch of 3/8" and 1/4" screws sticking out of the desk in various locations. This will allow me to have up to 4 mount locations for my Ball Head holding a dSLR, and 6 possible locations for the GoPro or Canon G11 on a standard mount. I have a coupling nut on the rig in case I want to use my Manfrotto flexible neck mount to get some "looking straight down" shots. 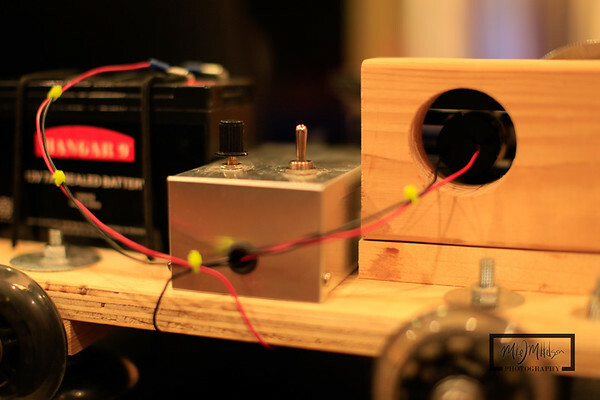 The guts of the Potentiometer are also inside the Aluminum housing, and allows the rotation to be extremely slow. I'm planning on putting the dolly on the ladder track this weekend to see how slow I can make it move. 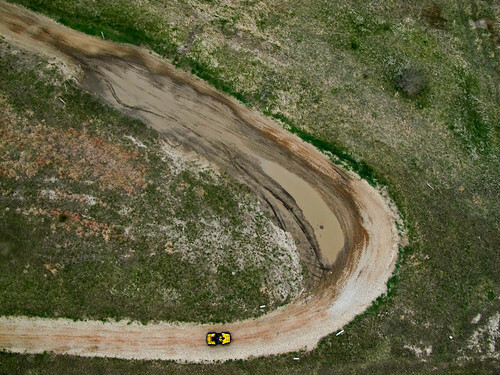 Worldwide Kite Aerial Photography week is now over. I was able to get 2 sessions with the kite in the past week. 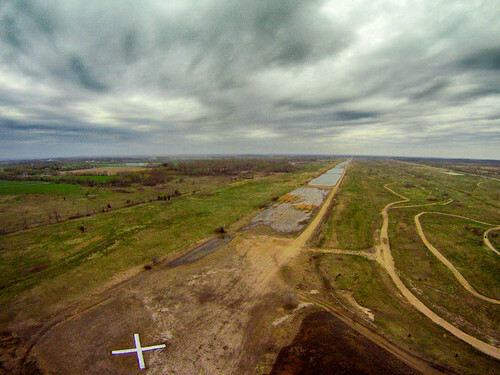 WWKW is a collaborative effort by the users of the KAP forum to actively get out and capture aerial images around the world. These images are posted to a flickr group, and a book is created each year. I was editor last year, and am glad to not have that responsibility again. 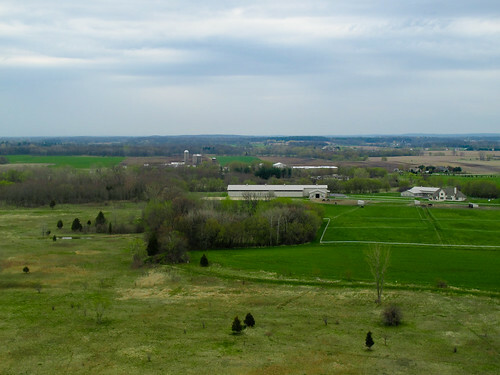 Bong offers space for many activitys, including dirt bike and ATV trails. There was a group also setting off model rockets, as well as a model airplane runway. It's a popular place for bird hunting as well. My dogs love being able to be off-leash and run through the brush. For additional images from my final session of WWKW click here. I modeled my dolly after their Mini-Rail slider, which can be seen here. The biggest difference is that my dolly slides on an extension ladder that I already had, so it's a bit bigger and can carry multiple cameras. They created the rails for their project. The ladder just seemed easier to me, but it's definitely not as portable. 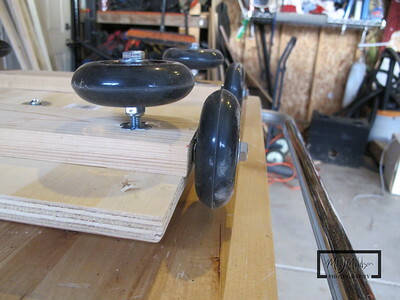 The concept of using scooter wheels with bearings is the same. I also was inspired by an additional post where someone created a system that pulled the dolly along the track using gear motors, which can be seen here. I purchased my parts from ServoCity.com, and used a few parts that I had lying around. I also ordered a new ball-head to mount on the dolly, but I'll also use it on my monopod. I decided to make my project come together a little easier by getting a gearbox that would slow down the rotation of my motor. You don't need a gearbox to complete this, but it definitely made my project easier. I am still waiting on a few parts, so for now, there is an on/off switch, the gearbox, and a small 12V battery, which was purchased from Horizon Hobby to run the motor. 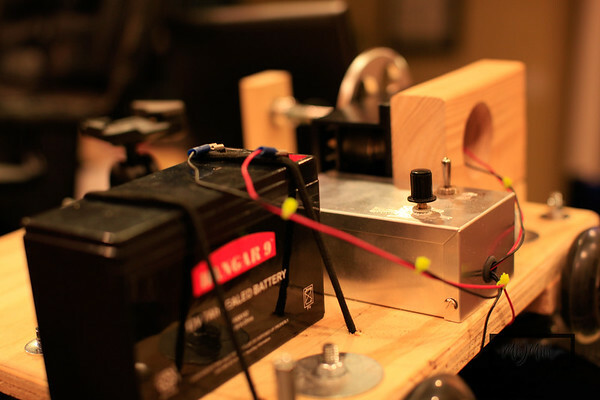 I purchased 2 motors for this project, but for the initial tests, I used a 3RPM motor. With the gearbox differential, it corresponds to about .355 rotations per minute. I'm waiting on a DC Motor Speed controller/Potentiometer that is en-route, which is the same one that they used in the "Building an Amazing Super Versitile DIY Time Lapse Dolly" on the DIYphotography.net website. 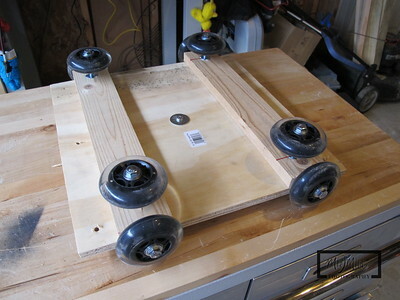 First, I created the Dolly using plywood, T-nuts, and Razor Scooter wheels. I went with a simple design where the wheels on the sides sit on top of the ladder, and the wheels on the bottom ride the inside rail of the ladder as it goes up the track. I also plan on using the dolly with my dSLR cameras, as well as the GoPro and G11 with CHDK, so there are multiple holes drilled in different locations on the board for mounting. 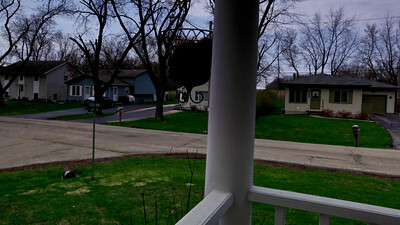 My first outdoor test with the dolly, I was using a Canon 5D Mark II, and 2 GoPro Cameras. 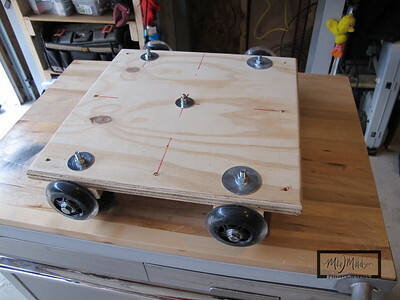 I used t-nuts and lock nuts to mount the wheels with the ability to tweak the distance of the wheel from the dolly board. Once is was fitted to the ladder, this should never have to change. I mounted the gearbox and motor to the front of the dolly. The battery is still not permanently mounted, but I wasn't doing anything that wasn't level in my tests. In my design, fishing line with 50lb test is mounted to the shaft of the gearbox, with the other end of the line tied to the furthest rung of the ladder. 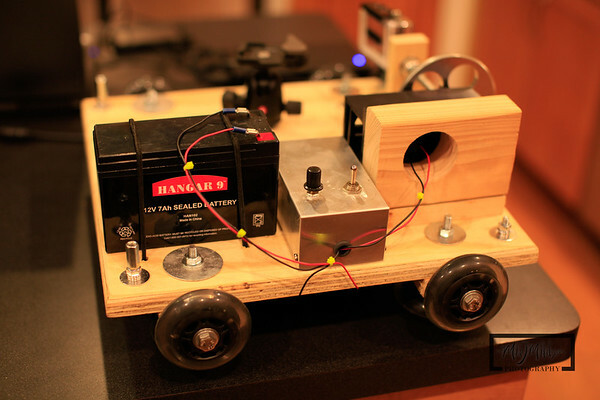 As the gear turns, it wraps the line around the axle, and pulls itself along the track. 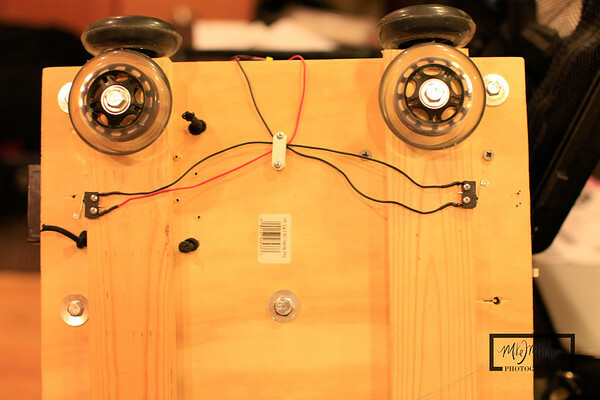 Other designs use a threaded rod attached directly to the motor, the moves the dolly up the track as the motor turns the threaded rod. Since I'm using half of a 28 foot ladder, I wanted to ensure portability at least for the dolly. The ladder can be mounted to the rack of my car for transport. 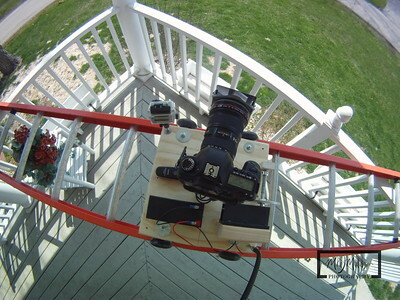 Here is an aerial view of the dolly with my Canon 5D Mark II, and a GoPro HD Hero camera mounted. The camera taking the picture is also a GoPro HD Hero mounted on a Manfrotto Flex neck mount, which will be nice if I need to extend the camera out over the dolly. 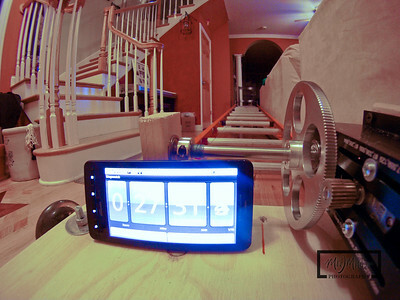 To get a better idea of the gear box, here is a picture from a time lapse sequence during the initial dolly testing. You can see that the string has started to coil around the shaft. The phone is being used as a stopwatch so I could calculated the speed at which the dolly moved up the ladder at full power. Once I get the speed control parts, I'll be able to make it move even slower. 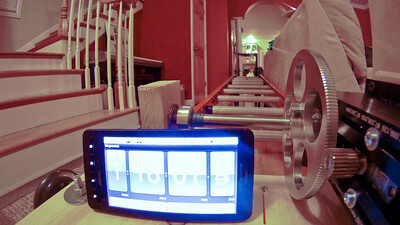 The initial test, conducted inside my living room because I couldn't wait to see if it worked, showed the the dolly moved 9.16 feet in 4 hours, or about 5.67 hours to traverse the 13 feet of usable track. Once the DC Speed Controller is added, I hope to create 12 hour time lapse sequences going the entire length of the track, or slower. 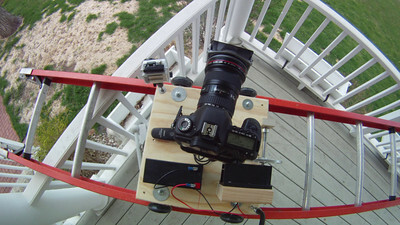 Using Adobe lightroom to fix the white balance on the GoPro HD Hero images, and Adobe After Effects to create the time lapse sequence, here is the first text of the DIY Ladder dolly in action. 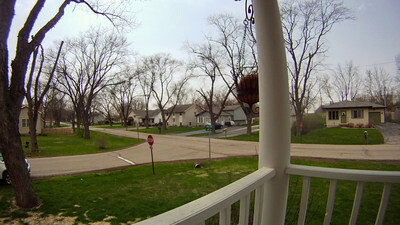 The phone was used as a stopwatch, and the images were captured at 30 second intervals. My wife had a busy day getting a yard/garage sale going, and I needed to get some other yard work done, but not before setting up the ladder dolly for some outdoor tests. 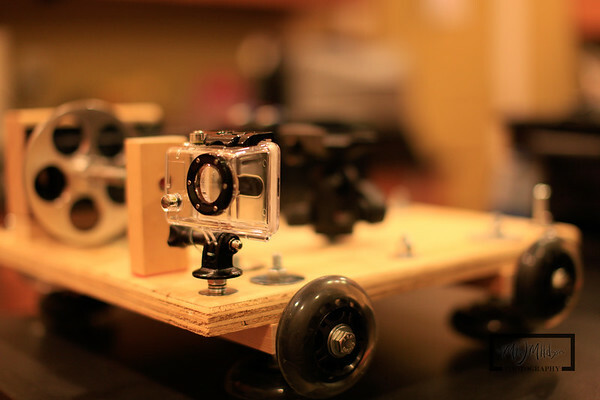 Here is the video capturing a bird's eye perspective of the dolly as it moves up the ladder. The GoPro is a great camera to get time lapse sequences, as it already has an intevelometer built in, and since it's very light weight, it doesn't hurt attaching another camera to the dolly to get a second perspective, especially since the GoPro is wide angle. The biggest problem with this design is the once the fishing line is coiled on the shaft, you either have to run the motor in reverse with the ladder at a high enough angle to allow gravity to pull the dolly back. Or, you have to manually unwind the fishing line, which takes about 10 minutes. The gravity trick is nice, but it also takes the same amount of time to unwind as it did to wind. I've also ordered some limit switches and plan on wiring this so that the dolly stops when it gets to the end of the track by cutting power. There could be some damage to the camera, gearbox/motor, or dolly if you forgot to turn it off, and the line kept coiling. Overall, I'm really impressed at how smooth the dolly moves on the ladder, which will be nice if I ever decide to use it for video. I selected this post to be featured on my blog’s page at www.photography-blogs.org.